We want everyone to understand CDI's newest product offering. To help you find the product to successfully bid your project we put together a brief list of terms that will hopefully answer your questions. Any roof curb, rigid or vibration, that have been engineered and stamped to meet current IBC 2015 (you may also hear this as complying or calculated). Curbs solidly braced or bolted directly to the building structure without vibration isolation. Vibration Isolated Allows flexible motion between equipment and the building structure with the use of vibration isolators (springs) used to separate equipment from the building structure. Maximum design load traveling through the load path to challenge anchors. A device for connecting equipment to the building structure. Anchoring system/systems used to connect equipment to the building structure. What the anchor attachments are installed into. Steel, concrete, wood members or surfaces that transfer the weight of the building and equipment to the ground. Angles or other steel shapes rigidly mounted to the building structure in a pattern around the equipment base to limit horizontal movement. The movement between two objects or surfaces. A load with varying magnitude over time. The distance between an anchor and the edge of the base material. How far a post-installed anchor is inserted into a hole after the anchor is set in place. Equipment supported on or from a vibration isolator. A spring isolator with steel guides usually separated by an elastomeric sheet located on two opposite sides of the spring (attached). Angles bolted to equipment and to the building structure, transferring the weight and earthquake load through the angles to the building structure. A factory built curb designed to attached equipment to a roof and containing vibration isolators, which allow for slight movement of the equipment. Anchors that are installed after the building structure is complete. 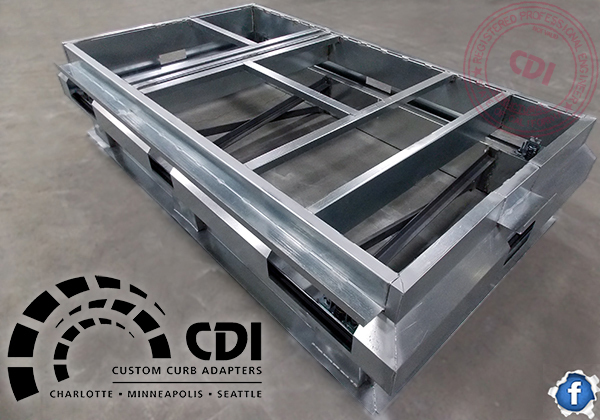 A sheet metal curb manufactured at a factory and sent to the job site. A vibration isolator containing a spring enclosed in a welded or bolted steel housing that limits the movement of the equipment attached. (use this when referring to the restraint of equipment movement with isolation curb, attached). An attachment device designed to help equipment withstand an earthquake. Load applied perpendicular to the axis of an anchor. A load that does not change over time.